Dennis Rodman, the "King of Rebounds", once partnered with Michael Jordan and Scottie Pippen to lead the Chicago Bulls to consecutive NBA championships from 1996-1998. Rodman’s outstanding performance included NBA rebounding titles for seven consecutive seasons, eight NBA All-Defensive team selections and two NBA Defensive Player of the Year awards. In order to reproduce Dennis Rodman’s hot-blooded style, ENTERBAY officially launched the long-awaited 1:6 Real Masterpiece NBA Series Dennis Rodman figurine! 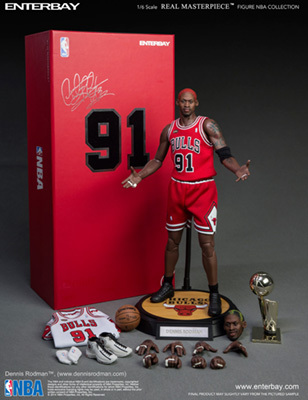 As a NBA fan and figurine collector, you must have it! Manufacturer Suggested Retail Price: $250. For Further Information, please visit: enterbaystore.com.